Stucky Schrock K, Hayes BL, George CM. Community-Acquired Pneumonia in Children. American Family Physician 86(7), p661-p667, 2012. SV. Hudson, SM. Miller, J Hemler, JM. Ferrante, J Lyle, KC Oeffinger and RS. DiPaola. Adult Cancer Survivors Discuss Follow-up in Primary Care: ‘Not What I Want, But Maybe What I Need’. Ann Fam Med Sep/Oct 2012, 10(5):418-427. Nearly one-third of office visits for cancer are handled by primary care physicians. Yet, few studies examine patient perspectives on these physicians’ roles in their cancer follow-up care or their care preferences. Forty-two survivors participated in the study. Most participants expressed strong preferences to receive follow-up care from their cancer specialists (52%). They described the following barriers to the primary care physician’s engagement in follow-up care: (1) lack of cancer expertise, (2) limited or no involvement with original cancer care, and (3) lack of care continuity. Only one-third of participants (38%) believed there was a role for primary care in cancer follow-up care and suggested the following opportunities: (1) performing routine cancer-screening tests, (2) supplementing cancer and cancer-related specialist care, and (3) providing follow-up medical care when “enough time has passed” or the survivors felt that they could reintegrate into the noncancer population. Among patients with Alzheimer’s disease who have had a response to antipsychotic medication for psychosis or agitation-aggression, the risk of a recurrence of symptoms after discontinuation of the medication has not been established. Patients with Alzheimer’s disease and psychosis or agitation-aggression received open-label treatment with risperidone for 16 weeks. Those who had a response to risperidone therapy were then randomly assigned, in a double-blind fashion, to one of three regimens: continued risperidone therapy for 32 weeks (group 1), risperidone therapy for 16 weeks followed by placebo for 16 weeks (group 2), or placebo for 32 weeks (group 3). The primary outcome was the time to relapse of psychosis or agitation. A total of 180 patients received open-label risperidone (mean dose, 0.97 mg daily). The severity of psychosis and agitation were reduced, although there was a mild increase in extrapyramidal signs; 112 patients met the criteria for response to treatment, of whom 110 underwent randomization. In the first 16 weeks after randomization, the rate of relapse was higher in the group that received placebo than in the groups that received risperidone (60% [24 of 40 patients in group 3] vs. 33% [23 of 70 in groups 1 and 2]; P=0.004; hazard ratio with placebo, 1.94; 95% confidence interval [CI], 1.09 to 3.45; P=0.02). During the next 16 weeks, the rate of relapse was higher in the group that was switched from risperidone to placebo than in the group that continued to receive risperidone (48% [13 of 27 patients in group 2] vs. 15% [2 of 13 in group 1]; P=0.02; hazard ratio, 4.88; 95% CI, 1.08 to 21.98; P=0.02). The rates of adverse events and death after randomization did not differ significantly among the groups, although comparisons were based on small numbers of patients, especially during the final 16 weeks. In patients with Alzheimer’s disease who had psychosis or agitation that had responded to risperidone therapy for 4 to 8 months, discontinuation of risperidone was associated with an increased risk of relapse. Baglia J et al. 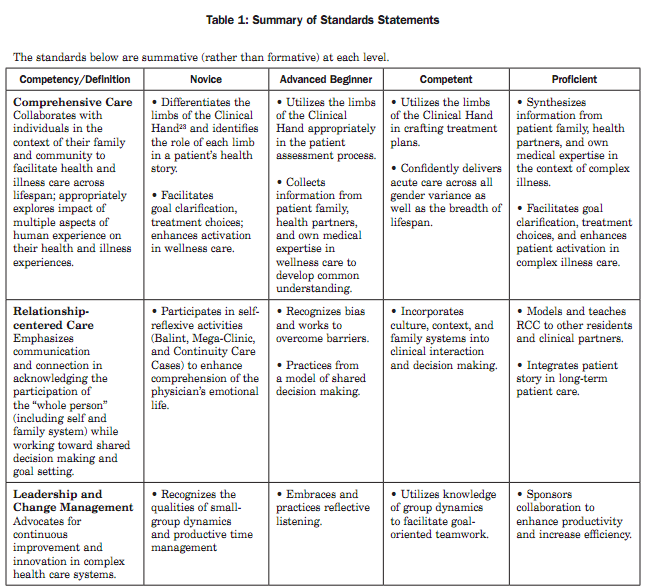 Generating developmentally appropriate competency assessment at a family medicine residency. Fam Med. 2011 Feb;43(2):90-8. Ten years after the Accreditation Council for Graduate Medical Education’s (ACGME) mandate that residency programs evaluate learners’ competency, research is needed to guide efforts to meet this challenge. 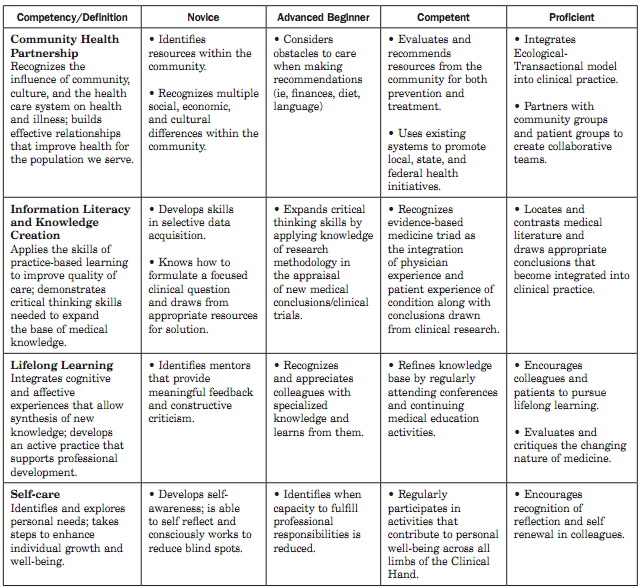 During an innovative residency redesign, the authors developed a process to effectively measure “competence.” This particular family medicine residency admits six residents per class year and is sponsored by an academic community hospital. Our objective was to generate developmentally appropriate observable behaviors that assess competencies. 5.	effective assessment practices are dependent upon ongoing faculty development. 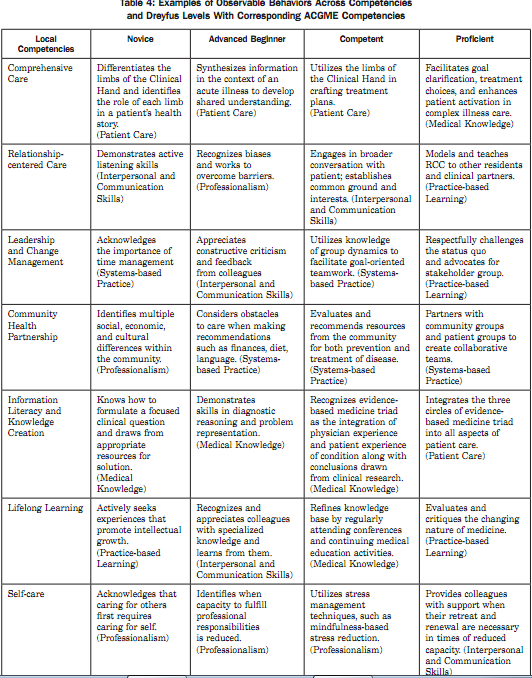 (8) Translate assessment tools for ACGME competencies. (2) generates global assessment of residents’ performance in both ACGME and residency-specific competencies. Narrative reflection was an effective method to tie observable behaviors to competencies. The process was time intensive; however, greater efficiency and enthusiasm is expected in the use of these assessment tools, with greater confidence in the program’s capacity to assess training outcomes. Future research should include comparison of these tools with those of other programs. 【文献名】Vons C,et al. Amoxicillin plus clavulanic acid versus appendicectomy for treatment of acute uncomplicated appendicitis an open-label, non-inferiority, randomised controlled trial. Lancet. 2011 May 7;377(9777):1573-9. BACKGROUND: Researchers have suggested that antibiotics could cure acute appendicitis. We assessed the efficacy of amoxicillin plus clavulanic acid by comparison with emergency appendicectomy for treatment of patients with uncomplicated acute appendicitis. METHODS: In this open-label, non-inferiority, randomised trial, adult patients (aged 18-68 years) with uncomplicated acute appendicitis, as assessed by CT scan, were enrolled at six university hospitals in France. A computer-generated randomisation sequence was used to allocate patients randomly in a 1:1 ratio to receive amoxicillin plus clavulanic acid (3 g per day) for 8-15 days or emergency appendicectomy. The primary endpoint was occurrence of postintervention peritonitis within 30 days of treatment initiation. Non-inferiority was shown if the upper limit of the two-sided 95% CI for the difference in rates was lower than 10 percentage points. Both intention-to-treat and per-protocol analyses were done. This trial is registered with ClinicalTrials.gov, number NCT00135603. FINDINGS: Of 243 patients randomised, 123 were allocated to the antibiotic group and 120 to the appendicectomy group. Four were excluded from analysis because of early dropout before receiving the intervention, leaving 239 (antibiotic group, 120; appendicectomy group, 119) patients for intention-to-treat analysis. 30-day postintervention peritonitis was significantly more frequent in the antibiotic group (8%, n=9) than in the appendicectomy group (2%, n=2; treatment difference 5•8; 95% CI 0•3-12•1). In the appendicectomy group, despite CT-scan assessment, 21 (18%) of 119 patients were unexpectedly identified at surgery to have complicated appendicitis with peritonitis. In the antibiotic group, 14 (12% [7•1-18•6]) of 120 underwent an appendicectomy during the first 30 days and 30 (29% [21•4-38•9]) of 102 underwent appendicectomy between 1 month and 1 year, 26 of whom had acute appendicitis (recurrence rate 26%; 18•0-34•7). INTERPRETATION: Amoxicillin plus clavulanic acid was not non-inferior to emergency appendicectomy for treatment of acute appendicitis. Identification of predictive markers on CT scans might enable improved targeting of antibiotic treatment.